The local protest was originally scheduled atop a plateau, but relocated due to heavy snow and strong winds, with participants enduring temperatures of minus 20 degrees Celsius and winds up to 50 kilometers an hour. After lighting the fire – and failing to get their banners to stay upright on ice blocks – a trio of speakers lit up the night. Most of the crowd were students from UNIS. Unlike other places in the world these students mostly stay here for a few weeks to a few months. Still, they felt the urge to get involved in what is largely a local issue. 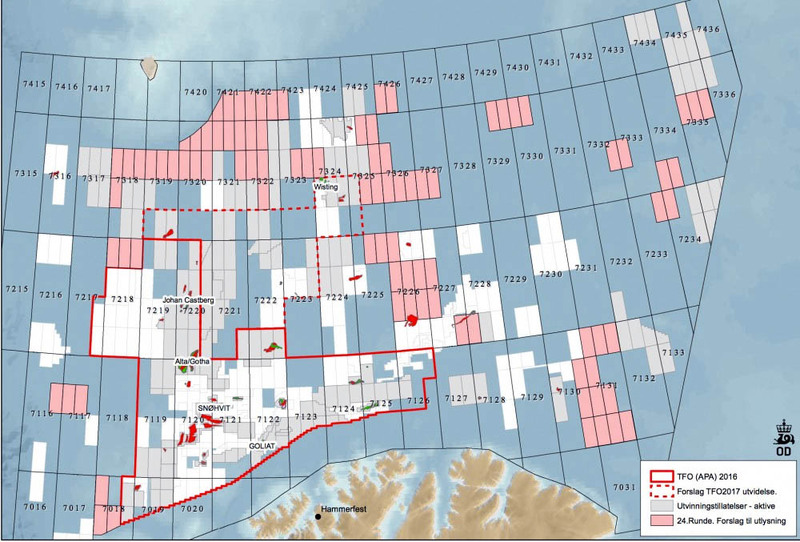 A map shows a record number of blocks in the Barents Sea that Norway wants to open to oil drilling. Map by regjeringen.no. Some of those opposed to drilling are resorting to more than protests and political appeals – and they may get some help, ironically, from Russia and other countries who are expected to argue Norway doesn’t have exclusive rights to the Svalbard zone (the ten blocks located on the 74th parallel – equal to the latitude of Bjørnøya) for drilling. 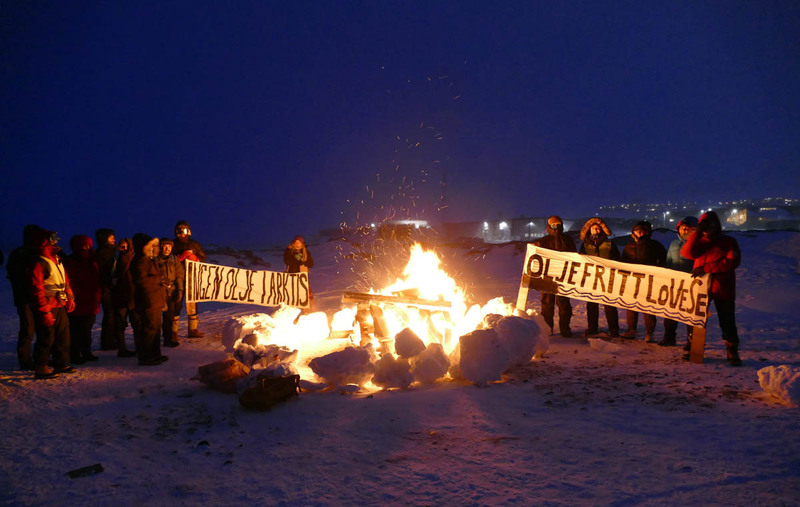 “Let’s just say the Green Party hopes to reverse this craziness after the election,” stated Espen Klungseth Rotevatn, local leader of the party and another speaker at the protest, when asked about Monday’s proposed drilling blocks. 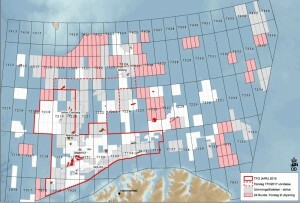 In addition to the 10 proposed blocks in the Svalbard zone, about 35 are just below it along the 73rd parallel. Greenpeace and other environmental groups have argued a spill could spread be extremely difficult to contain and cleanup due to the harsh weather and terrain. International challenges about rights to specific areas have been fought across the Arctic for decades, with Norway now facing challenges to its interpretation of the Svalbard Treaty from the EU about commcerial fishing rights as well as from Russia about oil exploration. But even if such challenges stall Norway’s drilling ambitions, it may simply pace the way for other countries to move in. Russia, for instance, announced last week one of its research vessel will spend 24 days studying the resource potential of the Svalbard shelf this summer, ten days longer than originally planned.